It took Microsoft more than four years, since iPad launch, to finally build office apps designed specifically for iPads’ touch interface. Finally office for iPad is here, offering a set of productivity tools designed to work seamlessly with their desktop counterparts. Office for iPad features enough functionality to suggest high productivity value for iPad owners. It is not perfect, due to some surprising gaps in the feature set, but overall, Microsoft has done a great job of creating something that would be a golden middle between the iPads touch and gesture interface and office suite products. 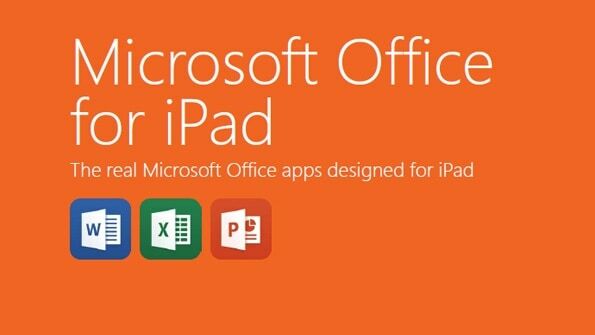 Office for iPad consists of three independent apps available on iTunes: Word for iPad, PowerPoint for iPad and Excel for iPad. All the three apps are free of charge with quite limited functionality. In case you’re not the Office subscriber, you can view documents, and even use PowerPoint files in presentations, but you can in no way create or edit any new documents. If you want to be able to create, edit and save new and already existing files, be ready to cash out $99 a year for subscription to Office 365 Home. The subscription has a real benefit – 20 GB of online storage, and the cross-platform access to your OneDrive files. All three apps are specifically designed for iOS 7, which leaves aside iPads with older versions of operating system. Wonderfully crafted, feature-rich apps for touch screen devices taking full advantage of the Apple ecosystem. No option to print documents. The Word for iPad has a familiar interface, and anyone who has ever used MS Word before will not have any surprises here – looks exactly like MS Word and Excel for desktops, featuring green borders and almost iconic symbols. The same can be told about the PowerPoint interface, even though the applications have been perfectly integrated to become a natural limb of the Apple ecosystem. The interface seems to be trimmer than that of the desktop applications, with reinvented menu ribbons containing the most essential features. You might feel a bit lost when you try to locate that “save” button until you remember there is no saving function on the iPads, or a feature that would enable you to print out your office documents from iPads. In fact, there is no such feature as printing out the file, which comes as a bit of a surprise, but Microsoft insists that “printing is an inferior mode of communication,” and defends its decision stating today’s communication resides in the digital arena. Microsoft may be 100 times right, but it will not prevent its users from demanding the printing option, and hopefully we will see the option roll out in the upcoming updates, and we expect these updates to be frequent. The lack of printing option is one of the few painful feature gaps in this otherwise perfectly polished group of applications, and there are a lot of great features to like about them. You’ll probably spend most of your time in this application, and Microsoft has done a great job solving the challenge of adjusting the app to the touch and gesture handled interface. There are no surprises here – from the good old Word icon on the home screen to the first look at the open document, there are highly distinguishable interface options and very welcome obviousness. At the beginning, you will need to sign into your Office 365 account using Microsoft’s iCloud keychain password management, so you will only need to do this once for all three apps. Below your office ID, you’ll find a small menu of file options on the left – open, new file and recent files; and a list of recently created files on the right, organized by date. The newest files are at the top, and according to Microsoft, the iPad is supposed to locally cache recently edited files for quick access. Nevertheless, it is quite evident that the iPad is downloading the files from the cloud each time you work with them, and it is not immediately aware that a newer version of the file is available. There are also options to file and pin, which keeps your defined files at the top of the list for easier access, and it is a very good option because there seems to be no evident way to search for files. 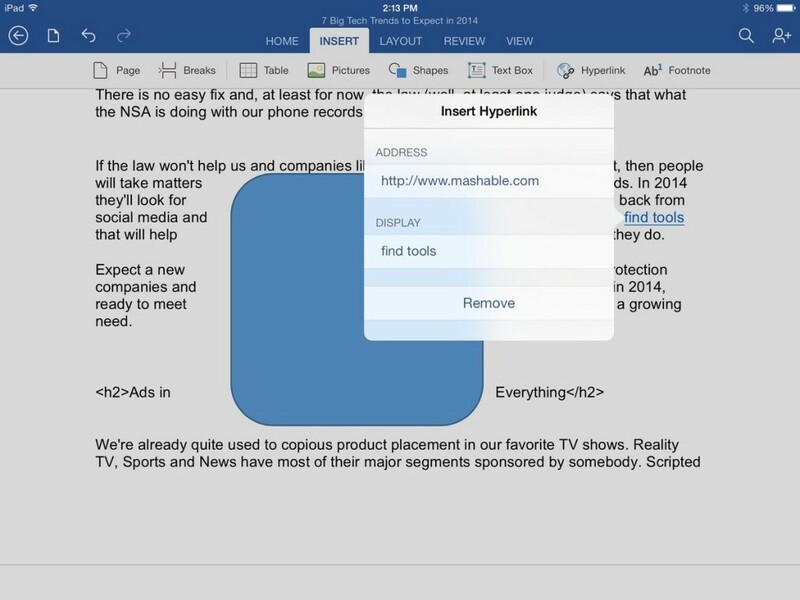 The “file” option allows you to share the file via email or create a link for editing and viewing, which is nice for mobile collaboration. Selecting the “new” file will open up the familiar grid of MS office documents templates and opening a new blank document requires only one tap, so you will not be missing those double clicks. In case you are still missing the “save” button, you can turn off the “autosave” option by tapping on the autosave button, and your “save” button will appear under the file/autosave menu. Word for iPad has been designed with iPad keyboard in mind, and you can choose to type in landscape or portrait mode, the latter being more convenient, but still somewhat stiff when compared to the regular keyboard. Most functions of the MS office desktop versions have been preserved, and you’re unlikely to find anything that you want to do that is not available on the iPad app. You will have to learn how to build tables all over again, though, because Word for iPad defaults to a grade of three rows by three columns, and you will need to add or remove them via a separate “insert” menu. The app works seamlessly with drag-and-drop option to insert and position photos and art in documents, even though it does not reposition blocks of text. The selection in the document is context sensitive, which means if you select, for example, a table, you will see a contextual menu appear with the options clearly visible. Spell-check also works in Word for iPad; it is automatic by default, and you will not be able to run through a spell check review. Instead, you will see the underlined words that the Word did not AutoCorrect while a single tap reveals replacement options. Search/find/replace works perfectly fine, and you will also find some cool collaboration tools like review, track, accept or reject changes alongside footnotes and columns. Overall, Microsoft succeeded in bringing Word for iPad in its full functionality to allow users work on any document, maintaining versatility and ultimate control over their workflow across multiple platforms. PowerPoint for iPad is a highly advanced visual tool offering a mighty load of image control features, perfectly suited for the iPad. No doubt it is a visual presentation platform designed specifically for iPads and it looks and performs seamlessly on Apple’s tablets. PowerPoint uses its own set of top ribbon menu items, such as Home, Insert, Transitions, Slideshow and Review. You will be able to create a fairly complex and visually rich PowerPoint presentation with bullet lists, graphics and text. Creating presentations, adding new slides and reorganizing the existing ones is intuitive and easy, you just hold down and drag the slide to its new location. Here comes one more significant limitation because none of the three apps has access to the iPad’s camera, which means you can add images from the Camera roll, but you cannot add images directly from the camera. PowerPoint does not support image cropping or adding videos to presentations, so if you need this particular feature, you can resort to Keynote. Microsoft generously added a hefty library of visually impressive transitions you can set on a per-slide basis. There is also a very nifty one touch presentation button and you can annotate it with a finger or a virtual marker during the presentation. To be able to stream your PowerPoint presentation to a connected Apple TV, you will need to access AirPlay from iOS 7 pull-up menu and enable screen mirroring. There is no option to do this from within the PowerPoint app itself. 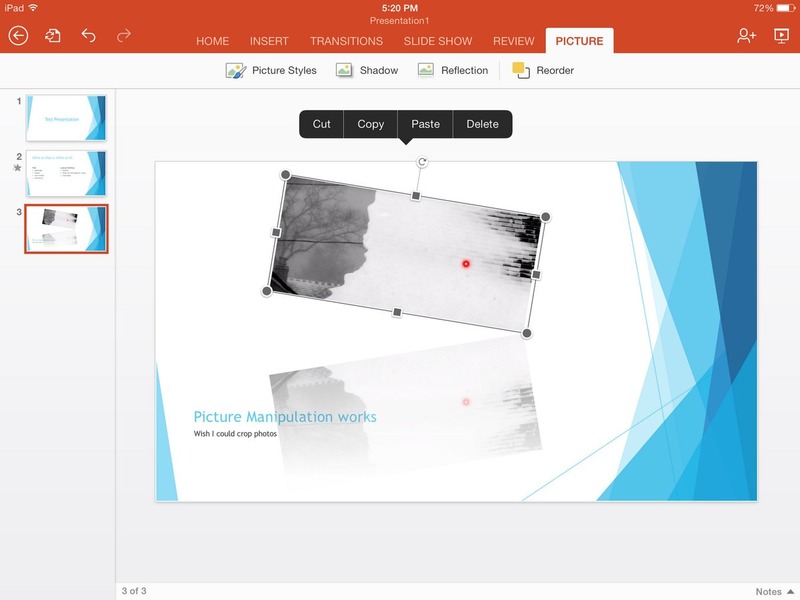 Other than that, the app works seamlessly; it is smart and responsive and offers great opportunity to edit and present PowerPoint files on the iPad. 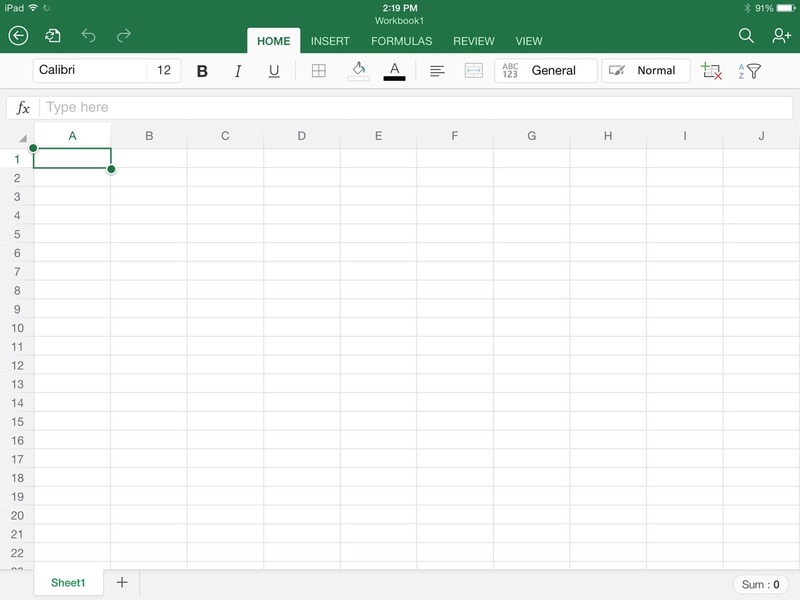 There are no surprises here, either, and if you know how to use Excel on a desktop computer or a Windows laptop, you’ll find your whereabouts in Excel for iPad. The familiar interface makes things easy, smooth and functional. There is one and significant discrepancy in the “formula bar,” where the desktop version puts the cursor in your chosen cell, the iPad app keeps it in the formula bar, highlighting the cell, so that you can see where you’re working. Some tasks, nevertheless, seem a bit complicated without a mouse to drag-and-drop items across cells. You can also add and label tabs, hide heading and the formula bar, and freeze panes. You will find Charts under “Insert” feature, which offers you a proper chart for your data and allows you to customize your own. It is worth mentioning that neither of the three apps have a usable scrollbar, and it is especially painful in Excel because if you load a long list of something in an Excel file, you will find no way to fast-scroll to the end of the spreadsheet; even zooming out doesn’t work. So, usable scrollbars are very welcome addition to the next update of the Office for iPad. Office for iPad is a superb set of applications that works as expected. You can easily copy-paste items across the three applications without losing the formatting. Microsoft has done a great job building these applications perfectly suited for the touch screen interface of the tablets – they perform smoothly, offering virtually all features you would expect in the Microsoft suite. Microsoft has a lot of work to release the Android tablets versions that is currently in the pipeline, and that printing option, but for now this is by far the best productivity set of tools and is very tough competition for Apple’s iWork productivity apps.